Lawrence Ferlinghetti is about to turn one hundred years old, and he still has plenty to say. In his work Little Boy – a sort of memoir-meets-polemic which he calls a “novel”- Ferlinghetti straddles an odd position: he is a living author who is often discussed alongside his peers as though he were a dead poet. The piece is at once a rebuke to this idea and a play on it. It begins autobiographical, as Ferlinghetti recalls his early years in the care of an aunt and later a wealthy older couple. But this quickly dissolves into a stream of consciousness that takes as its subject the century the author has observed. “But in any case now it’s time it’s high tide time to try and make some sense or cents of our little life on earth”, he writes. Here is everything you need to know about Ferlinghetti’s attitude. He is introspective, it’s true. But he is also playful, using puns and self-deprecating jokes to puncture any sense of grandiosity. The weight of the years is heavy in the mass of allusions to everything from Giacometti to Nat King Cole, Coleridge to Marlon Brando. But the style rebels against the confines of age. Gone is the shapely arrangement that gave such a visual rhythm to his best poetry. Instead Ferlinghetti talks and talks for pages and pages, not stopping for punctuation, relying instead on capital letters and Biblical “and”s to give himself pause for breath. This childish cry of “Me-Me-Me” recurs throughout the work, at once an impatient call for attention and a Plath-like affirmation of existence. Ferlinghetti is forming himself on the page, fashioning his own eulogy. Faced with the possibility of this work being the last thing he leaves behind, he enters himself on a family tree of writers: references both oblique and obvious are littered throughout, conjuring James Joyce, Marcel Proust and Samuel Becket. Yet this is not a self-absorbed work. 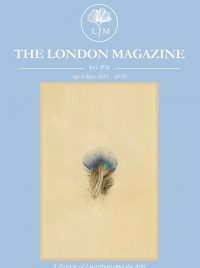 At first Ferlinghetti tells us that the only plot of this book is “my constant aging”, but this quickly shifts: “what is the plot of this novel if not the remembrance of things still not past for the past is but a cautious counsellor of what has yet to come what has yet to transpire or expire”. He circles back to his own youth with that “me-me-me” again, trying to remind the reader that they too will one day be old. Despite the immediacy of his prose, Ferlinghetti is constantly out of reach on this plane of accumulated experience. He does his best to share it with us, but at the same time he is somehow watching from the outside. “AND every day in this grand little café of life I sit waiting to see how our little civilization develops, not to mention how our little consciousness might develop”, he writes. The narrative spans a century and crosses the Atlantic several times, but so often we find ourselves back here, sitting with Ferlinghetti in his real-life local haunt of the Cafe Select in San Francisco. Or sometimes we seem to be in Paris, watching from afar as Simone de Beauvoir has lunch with Jean-Paul Sartre. Ferlinghetti uses the recurring image of a cafe to round off his little life. Whatever the situation, he is always in a state of isolation. Adrift from his fellow customers in “the habitation of all lonely people”, he is distant enough to look back on his life and take stock of the world. Reading the work feels like talking to someone who can see the view better from where they are standing. It would be easy then for Little Boy to veer into becoming a sanctimonious tract; Ferlinghetti insists he is no “old geezer”, but he piles thoughts on top of each other in the style of a rant. Are we to read it with the same bored acquiescence with which we would humour an old man in a pub? Thankfully we are saved from this fate by Ferlinghetti’s humour. In fact he tells us himself not to take what he says too seriously: “If you think you’re going to learn from me any secrets of the universe or of the human heart well then you’re a bigger idiot than I supposed so you might as well stop reading this drivel”. 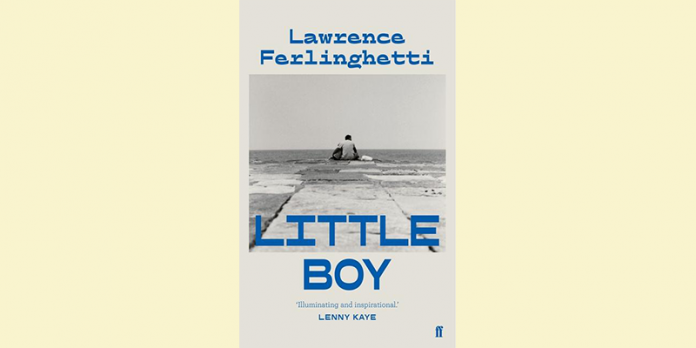 Little Boy by Little Boy by Lawrence Ferlinghetti will be published by Faber & Faber on April 4th 2019. For more information and to pre-order, go here.